Bolsonaro has been very clear about who he considers being his international allies and those he views as foes. Rio de Janeiro: Far-right congressman Jair Bolsonaro will take oath as the new President of Brazil on Tuesday, stated media reports. The ceremony is scheduled to take place inside the chamber of the national Congress. On October 28 this year, the 63-year-old Bolsonaro won the presidential election with a margin of about 10 million votes over against Fernando Haddad who represented the left-wing Workers’ Party, stated a report by BBC. Bolsonaro rose to power as he promised to eradicate the corruption and crime in the country during the election campaign. Despite being stabbed at a campaign rally in the month of September 2018, Bolsonaro continued to conduct the campaigns from the hospital he was admitted. Bolsonaro has served seven terms in Brazil’s lower house of Congress, the Chamber of Deputies, before being elected President. He has been a member of several political parties but is currently in the Social Liberal Party (PSL). Before becoming a politician, Bolsonaro served in Brazil’s military, where he was a paratrooper and rose to the rank of Captain. During his time as a lawmaker, he represented the interests of the armed forces and since his election, he has named seven former military men to key ministries. However, most of the people in Brazil are deeply angered by Bolsonaro and identify him as a racist, homophobic and misogynistic person. He is considered a threat to the democracy by many critics. After more than 20 years under military rule, Brazil returned to democracy in 1985. Since being elected, Bolsonaro has repeatedly stated that he is committed to democracy and that he will abide by the Constitution. But previous comments he has made endorsing the use of torture and disparaging women, gay people and Afro-Brazilians have left many worried. Bolsonaro has been very clear about who he considers being his international allies and those he views as foes. 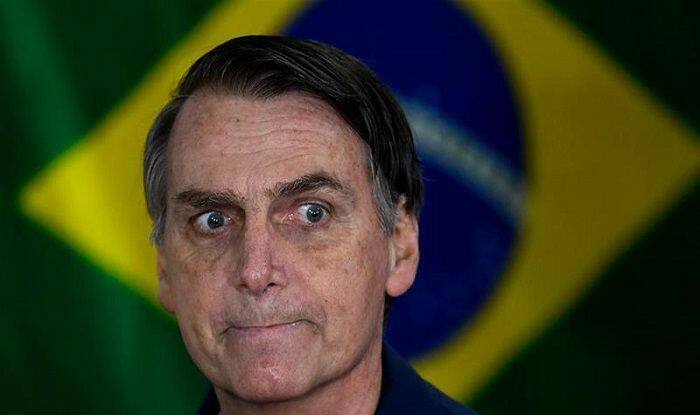 US President Donald Trump is “an example” to him, and Bolsonaro has promised to follow the US and relocate Brazil’s Embassy in Israel from Tel Aviv to Jerusalem.